I’ve written a lot about Black Sabbath. Here’s some more. The original UK pressing on Vertigo is a relatively straight forward, simple design, but this record certainly has the most alterations and variations in comparison to any other Sabbath LP cover. 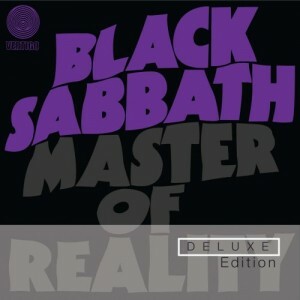 The original UK pressing has a black sleeve, with “Black Sabbath” in purple, and then “Master Of Reality” embossed below it. The UK edition was housed in “box” style sleeve with a flap at the top, and as if to add some much needed colour, also came with a very nice poster of the band standing in a forest or wood, taken by Keef (who was responsible for photography for the first four Sabbath LPs). An alternative take from this photo session appears on the 1982 picture disc release of Paranoid. Unsurprisingly, few copies survive with posters intact, and can attract high prices when they are included. European versions also featured the same black and purple embossed cover design, but with more conventional sleeves. Original Japanese editions of the LP had the same design, but with the band name and title printed in white on a black background. These variations may have been due to production limitations in different territories, or possibly deliberate decisions made in these countries, but in my opinion it was simply due to misunderstanding or miscommunication between different countries. Now, virtually all design work is produced and supplied on computer, more often than not via an Apple Mac, but up until the early 1990s, designs were supplied to and by record companies as “flat artwork” with instructions for layout and colour added in writing on overlays of tracing paper of clear acetate. As artwork was often the last thing to be produced, after the record was in the can, it was regularly rushed to meet deadlines, then would have to be dispatched across the globe to different territories. Today, when artwork can be supplied on disc or via the internet, created using universally used programs, the room for error is small, and because of emails and the internet, approvals can be instant. This would not have been the case in 1971. In 1973, Black Sabbath’s catalogue moved from Vertigo to the new WWA Records imprint. Evidently, it was still manufactured and produced by Phonogram (who also released Vertigo), as it was common to find old Vertigo sleeves with new WWA pressed vinyl, but with new WWA catalogue numbers stickered over the old Vertigo catalogue numbers. WWA’s Master Of Reality still came with the poster, but the glossy sleeve was no longer embossed necessitating the title to be reproduced as an outline, otherwise it would not be visible. Original Brazilian pressings has the title in orange (and black, purple and orange is not a complimentary mix of tones), and later Brazilian pressings included an even more lurid mix of colours. Other variations include the title in white outline and the whole cover printed in black and purple (in US) and black and blue (in Canada). When I came to design the recent remasters for Universal, it was the non-embossed purple band and title in Purple on a black background we went for. Korean pressings featured the poster photo on the front, and apparently Master Of Reality was also issued as a gatefold sleeve in New Zealand, but I’ve never seen a copy.